PanARMENIAN.Net - Jon Snow (played by Kit Harington) has a tough a year ahead of him as he has now partnered up with Daenerys Targaryen (Emilia Clarke) in "Game of Thrones", Express says. But with a war on its way, Jon and Dany may find themselves in a bad way, leaving their lives in danger. Kit has now spoken out about the finale of the series, and warned fans that it may not be as conclusive as expected. Speaking to MTV News he said: “I think a TV series that’s spanned eight, nine years is an incredibly difficult thing to end. But with many fans eager for their favourite character to make it through the final season, it will be difficult for everyone to be satisfied. However things may end up being more brutal than initially expected, as Kit went on to mention the finales of other shows. But could this be a subtle hint to how the HBO show will end? The Sopranos famously ended with a stark cut to black after a long final series - could this be in store for the last episode of the fantasy epic? Similarly, "Breaking Bad" ended in a harrowing way, as the show’s protagonist Walter White (Bryan Cranston) is last seen laying on the floor after being shot - however it was unconfirmed whether he would survive or not. With Jon’s new allegiance and relationship with Dany blossoming, he may be left in a tough situation in the final season. As Dany is eager to take over all of Westeros she may find herself in a situation which will leave her taking on the rest of the Starks in Winterfell. But Jon may not see eye-to-eye with this decision, and could find himself on the attack against his new beau. 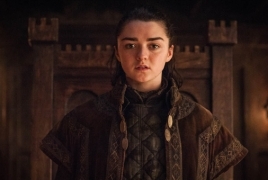 Kit’s hint follows a fan theory that Arya Stark (Maisie Williams) may have already sealed her fate. Express. Game of Thrones season 8 spoilers: Did Kit Harington reveals HBO finale after MAJOR hint?